Fooducopia supplies me with products to write about and when I saw the jar of Gilberto's Sort of Smokin' Mango Salsa waiting for me, I wondered if there would be something different enough about it that would inspire a new recipe. I mean, there are a lot of salsas out there. And I've made plenty of my own salsas. A lot of salsas are very similar to each other. Tomatoes, onions, peppers. There are only so many ways you can combine them. Most of them are good, but a lot of them are also similar to each other. I cracked open the jar the new salsa and introduced it to a chip. And then another one and another one. It was a miracle that I managed to put the jar away while there was still enough to use in a recipe. Yep, there are a lot of salsas out there, but this one got it right. A good balance of flavors and the right amount of heat so you can eat it plain without blowing puffs of smoke out your ears or burning out your tastebuds. 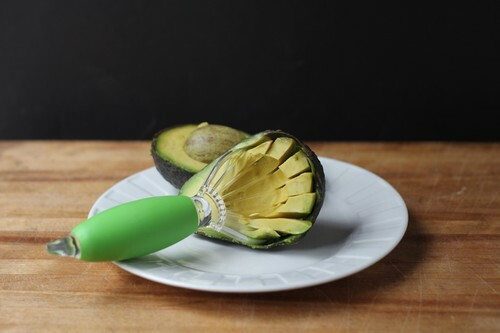 Avocado slicer from Good Cook. Maybe you like hotter salsas, and that's okay. I've eaten - and liked - hotter salsas. But this one, right off the bat, had a lot of potential for recipes because it had all that interesting flavor along with the heat. I knew that I needed to come up with a recipe where the salsa was a major flavor component instead of an accent. The idea for this recipe started with the idea of eggs in purgatory where eggs are baked in a tomato sauce. I've done the same thing with eggs baked in salsa. You end up with eggs that are like poached eggs, but they're in the tomato sauce. But ... it's summer. No one is going to want to bake eggs. So I poached them instead. The other ideas rattling around in my head were nachos and chilaquiles. When I combined them all and teased them apart again, this is what I got. It's great for a spicy breakfast, or for a light lunch. Arrange the tortilla chips on a plate. Top with the grated cheese and microwave until the cheese is melted, about 10-15 seconds. Place the poached egg on top of the chips (try to avoid pointy chips so you don't break the yolk), Drizzle the salsa on, then top with the avocado. Serve warm. Note: you can add more toppings: diced tomatoes, sour cream, thinly sliced scallions, refried or pinto beans, cilantro, more cheese ... whatever you like. To be clear, I'm not reviewing or endorsing the products in this recipe (unless I saw otherwise). 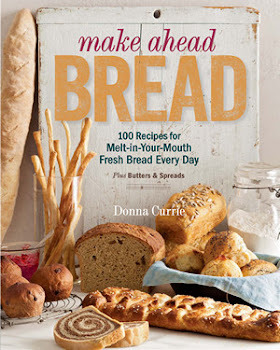 I've created the recipe for Fooducopia to post its site and I'm re-posting the recipe here for my readers as well. Then again, since I created the recipe, rest assured that I liked it. I don't cook stuff that we're not going to eat. This is a very creative and delicious looking combo! I love nachos, but I would probably save this for lunch or dinner. I'm more of a cold cereal kind of girl in the morning. I've never cared for peppers or tomato salsa in most tex-mex breakfasts, so I was very happy to see your recipe. Thanks!